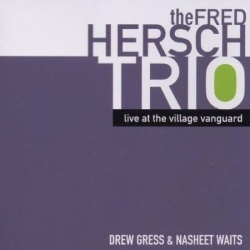 Fred Hersch already had a lot of mileage in his rearview when he recorded Live at the Village Vanguard, in the spring of 2002. An acutely intelligent pianist who hit the ground running in the '70s, he put in serious apprenticeship hours with Joe Henderson, Stan Getz, Art Farmer and others. But a turn-of-the-century run of gleaming songbook albums (on Nonesuch) had begun to make him feel pigeonholed. He came to the Vanguard ready to throw down. Hersch had another album in the works when we spoke: Leaves of Grass, a brilliantly realized suite inspired by the poetry of Walt Whitman, with vocals by Kurt Elling and Kate McGarry. Last fall I found myself back in the SoHo loft interviewing Hersch about this very suite, for an episode of Jazz Night in America. We also talked about ood Things Happen Slowly: A Life in and Out of Jazz, the memoir that Hersch had just published, to deserving acclaim. But back to Live at the Village Vanguard. I could just as easily selected a more recent album by Hersch — say, Sunday Night at the Vanguard, which chronicles his current trio, featuring John Hébert on bass and Eric McPherson on drums. (The same trio released another fabulous effort, Live in Europe, this year.) For that matter, I could have chosen Leaves of Grass. One reason I didn't: I see the 2003 Vanguard album as pivotal, and will confess to a certain sentimental attachment. There are no fewer than six Hersch originals on the album, and this was noteworthy at the time: he was really just beginning to come into his own in that respect. Listen to "Endless Stars," a flowing ballad in straight-eighth time, and you hear the full measure of Hersch's gift for melodic construction, and for a thematic development that feels effortless. Besides which, this is a song, in the fullest sense. In fact, it was only a year later that Norma Winstone released a version with her lyrics, calling it simply "Stars." (Hersch is her partner throughout the album, called Songs & Lullabies.) I'm including that here, too. Purchase Live at the Village Vanguard at Amazon or Discogs.